With Lalla Salma during a visit to the Moroccan Red Crescent Non-Formal Education Center. Enjoys dynamic musical performances by young people in the Aprendiz (apprentice) City-School. Joins some students at a class for teaching English, where she taught them a few words in Arabic. Joins youth in a discussion moderated by a UNICEF representative to hear about their experiences and what the school means to them. تلقي كلمة خلال افتتاح المؤتمر التربوي الاقليمي "برامج المعلمين على مفترق طرق"
With Princess Sumaya, Prime Minister Nader Dahabi, Senate President Zeid Rifai, Chief of the Royal Hashemite Court Nasser Lozi and Chairman of the Board of the Academy Dr. Safwan Al Masri attend the inauguration of the Queen Rania Teachers Academy. looking on as a teacher of the Arafeh Primary School for Boys, who is one of the recipients of the Queen Rania Award for Distinguished Teacher 2006, tutors his students. Chats with teachers at the Queen Rania Award for the Distinguished Teacher ceremony. Touring the vocational educational hall of the Deir Abi S'eed Comprehensive Secondary School for Girls, where she launched the third round of the Award for the Distinguished Teacher. Their Majesties King Abdullah and Queen Rania with the winners of the King Abdullah II Award for Physical Fitness. With school children at the Children's Museum. The museum is the first interactive, hands-on, learn and play centre of its kind in Jordan, with a mission to encourage lifelong learning for children and their families. تشارك مجموعة من الأطفال وضع اللمسات النهائية على معروضات متحفهم الذي يعتبر الأول من نوعه في الأردن. During dinner banquet held by the Children's Museum to honor its sponsors. Their Majesties King Abdullah, Queen Rania, Prince Hashem, Princess Iman and Princess Salma during the opening of the Children's Museum. ـoins children from different parts of the Kingdom in their activities, which were organized by the Children’s Museum and Zaha Cultural Center. ًWith Prince Talal Ben Abdul Aziz laying the cornerstone of the Arab Open University (AOU) campus in Jordan. 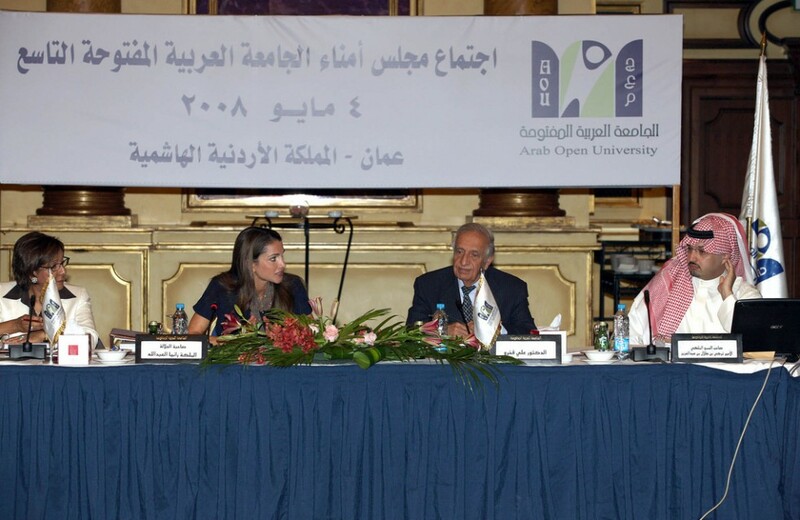 Attends the ninth board meeting of the Arab Open University. Checks on Tawjihi students, during a surprise visit to a girls’ school. Interacts with students, during a visit to Gyermekek Haza, an exemplary school in Budapest that has worked to integrate students with disabilities into mainstream education. تتحدث مع الطلاب خلال زيارة إلى إحدى مدارس العاصمة الهنغارية بودابست التي تطبق نموذج إدماج طلاب ذوي الاحتياجات الخاصة ضمن صفوفها. At the United Arab Emirates Center for Arabic Language and Islamic Studies of Beijing Foreign Studies University. Checking on a classroom during a visit to the Amr Bin Al Aas Primary School. Checking on facilities at the Sabha Elementary School for Girls, during a visit to the area. With students of the Khawla Bint Tha’laba Primary School in Sweileh, during which she also announced that she will be adopting the school, along with three others she has recently visited in the areas of Salboud, Ruseifeh and Sabha. King Abdullah and Queen Rania with children at the Abdullah Ben Um Maktoum School for the Blind and Visually Impaired.